Asahiyama Zoo in Hokkaido is one of the most popular zoos in Japan, with a visitor count of over 3 million a year. This number is surpassed only by Ueno Zoo in central Tokyo and the race is close, with a difference of a scant half-million in 2006, compared to a population ratio of 320,000 : 13 million. OK, so maybe comparing the population of the extensive sprawl that is Japan's capital city with the more immediately situated population in the small town of Asahiyama is a little unfair, but the point I'm trying to make is ... penguins. 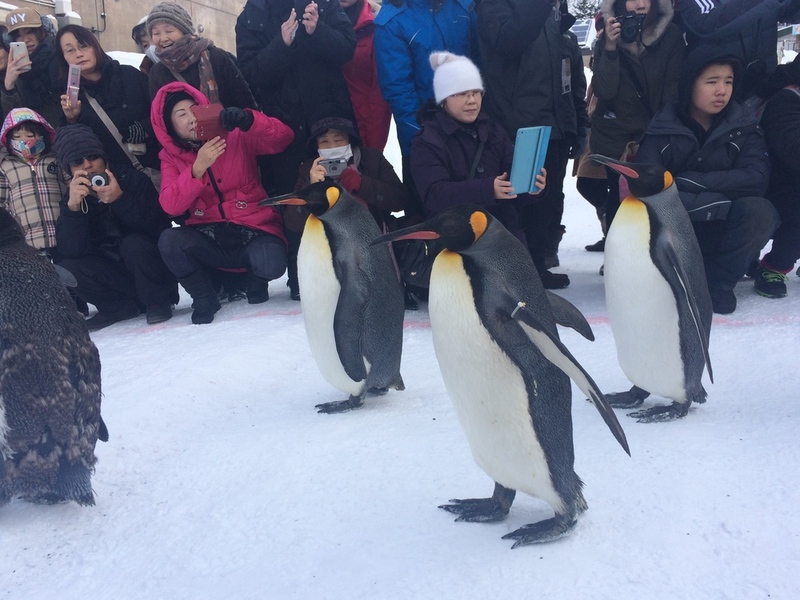 In winter, Asahiyama Zoo is all about the penguins. The zoo opens at 10:30 am and exactly half-an-hour later, the penguins march. Guided down a snow packed path through the centre of the site, visitors get to see these black and white dinner jacketed residents in all their close-up glory. The penguins are clearly used to this deal, and could be seen lining up just inside their enclosure before the gates swung open. Most of the penguins marching were the large King Penguins (second only in size to the Antarctica-dwelling Emperor Penguins) , although one small flippered number was seen pelting long at top speed in a manner that suggested it had snuck out with the crown. Originally, we had assumed that this march was to move the penguins from their overnight enclosure to one used during the day. This made sense, since there was a second march just before the zoo closed at 2:30 pm. However, we later stumbled upon the end point of the penguin march to find .... only storage crates. This mystery is further compounded by the penguins mysteriously appearing back in their original enclosure at 2:30 pm, without ever having been seen to move. The only logical conclusion is that Asahiyama Zoo has a penguin transporter. One day, it will work for humans too. While the penguin march is a clear highlight, Asahiyama's draw also comes from its imaginative under-water viewing areas. The penguins, polar bears, hippo and seals all have glass walled rooms alongside their large swimming tanks. The penguins and the seals are perhaps the most interesting, where the former allows you to walk through a glass tube within the penguins' pool and the latter has the reverse, with a tube that seals can swim through running down the centre of the room. Similarly, the indoor chimpanzee house allows you to follow a route that takes you level with the top ranks of the chimp's gym. The upshot was I got to see a chimpanzee's foot and bottom amazingly close up. The foot was disconcertingly human; a fact I knew in principal but hadn't actually seen before. On the bottom, I merely note that I have seen better and worse. The rest of the zoo does depend a little on your opinion of zoos. The smaller animals and water-based numbers looked pretty content, but the lion was clearly struggling in an enclosure largely inaccessible due to the accumulation of snow. To combat this a little, the zoo did have restricted viewing on the warmer-climate animals: lion, panther, hippopotamus and giraffe, which could only be seen from 11 am to 2 pm. Additionally, several enclosures were closed entirely and only reopen in the summer. Doubtless this reflects the problem of keep a zoo with 150 different species happy in a climate that goes from deep snow to considerable humidity. The penguin march, meanwhile, balances this loss and only occurs in winter since the birdies in question have absolutely no qualms about packed snow on their tootsies. In one corner of the zoo, there is also a small animal and petting area that was stuffed full of goats (one of which was most definitely stuffed full of more goats), guinea pigs and rabbits. I found this far more captivating than it had any right to be. Why are guinea pigs so hilarious? Maybe to make a mockery of us all. The restaurant was rather good and reasonably priced, but far too crowded. More fortuitously, the same applied to the gift shop, preventing the purchase of a giant person-size stuffed King Penguin to replace me in my office next year.